^ Montoya J, Liesenfeld O (2004). “Toxoplasmosis”. Lancet 363 (9425): 1965–76. doi:10.1016/S0140-6736(04)16412-X. PMID 15194258. https://www.thelancet.com/journals/lancet/article/PIIS0140-6736%2804%2916412-X/fulltext. ^ Jones, Jeffrey L.; Kruszon-Moran, Deanna; Sanders-Lewis, Kolby; Wilson, Marianna (2007-9). 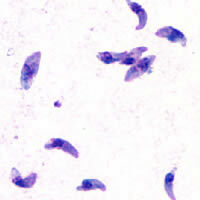 “Toxoplasma gondii infection in the United States, 1999 2004, decline from the prior decade”. The American Journal of Tropical Medicine and Hygiene 77 (3): 405–410. ISSN 0002-9637. PMID 17827351. https://www.ncbi.nlm.nih.gov/pubmed/17827351. ^ Jones JL, Kruszon-Moran D, Sanders-Lewis K, Wilson M (2007). “Toxoplasma gondii infection in the United States, 1999-2004, decline from the prior decade”. Am J Trop Med Hyg 77 (3): 405–10. PMID 17827351.